As everyone who has an interest in the Tarot, I do have some "favorite" cards. These are the ones that I feel the strongest connection with, or that I find are underrated, or those who I am simply always happy to see. They were especially inspiring for me while creating the deck and I tried to make their character visible the best way. 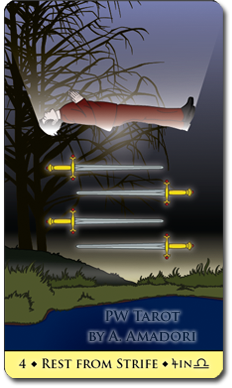 The following explanations can also help you while doing a reading with the Parallel Worlds Tarot. Of course, in the little companion booklet that comes with the deck, all cards are explained too, but much shorter. In many readings I experienced that the Emperor is not really very popular. I want to take up the cudgels for this important card. 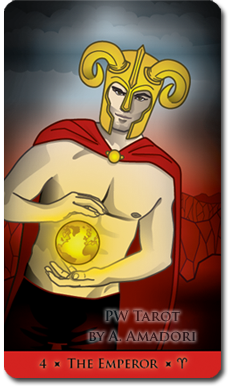 From a spiritual viewpoint of the Tarot, the Emperor’s energy is the reason why we are alive at all. It is the same energy that you feel pumping in your veins. It is the energy that already gave our ancient ancestors the courage to pick up their weapons and fight animals twenty times their size. It is the energy that forces your tired body to swim when you have drifted away from the shore. In a less dramatic way, the Emperor’s energy is the same reason why we clean up our rooms, bring our things in order and are able to plan our daily life so that chaos may not overcome. Because it will, if we are not structured. Nature (the Empress) needs structure (the Emperor) and vice versa. The Empress loves the Emperor with all her heart, they are an inseparable couple, and the reader should appreciate this powerful card alike.In my version, he is less the „old despot“ as which he is sometimes (unintentionally) depicted, and where I think most of the reluctance originates from. I decided to depict the Emperor as the energetic strong male that is similar to the energy he represents. He forms and protects what the Empress has brought to live. This card is a very positive one. The Abundance here means not only material abundance, but also an overflow of all riches. The joys of love, a good nights sleep or an opulent meal are just a few examples. 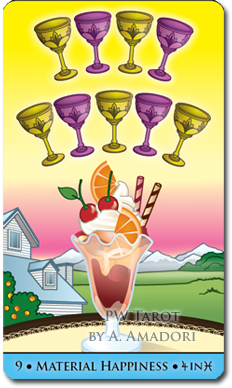 Generally the three of cups is read as a card that foreshadows festivities, family, presents or the good outcome of a problem. I depicted the card here with John the Baptist. The joy of life and the abundance he must have experienced in his secluded life in the forests, meadows and caves originated in inner and not outer riches. The element of water is naturally connected to him. The passage of the bible where John is baptizing Jesus is one of the very uplifting ones, which make up a bit for the many brutalities described in this book, too. Here we see a creature that could be the much-quoted ghost under the bed. If you occupy yourself a bit with the topic of ghosts, you may notice a similarity in most reports of eye witnesses who tell about their experiences with ghosts or apparitions: the ghosts or apparitions do not seem to scare on purpose, they mostly scare us because we did not expect to see them. Ghosts, if I may continue to use this word as a collective term, seem to be trapped. Most of them do not know that they are dead, others seem to know and their desperation is, how I see it, the real horrifying fact about ghosts. Our creature here is trapped under the bed. It was attacked but it is still there. It is hiding, waiting anxious for something to happen - or hoping that nothing will happen. The feeling of not knowing how to continue, not daring to move a muscle out of anxiety that things could get much worse is something we all know from certain times of our lives. Let us hope that someone finds this creature and guides it from out of its hiding place to freedom. This card is also a not very popular one amongst querents in a reading. On many cards the devil is shown as a creature with a goat’s head and legs, a human torso and sometimes bat wings. The negative aspects represented by the Devil, like greed, envy, hoarding of materials, are the result of wrong conceptions. Example: You wish to achieve economic well-being - there is nothing wrong with that. The next step is to imagine and plan how to succeed, and at some point this plan may get out of control. Greed may take over, maybe only out of fear that you will not achieve your goal. Greed will drive your business partners away and lets you make more wrong decisions that leave you in poverty - the opposite of what you actually wanted! So the goal was not wrong but the imagination and development. The result was twisted. The traditional image of the devil represents this twisted outcome: we imagined something we wanted and out comes a creature half man half goat with bat wings! Best way to take it is with a laugh. 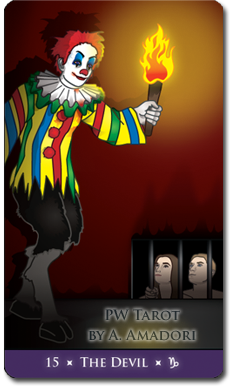 In esoteric Tarot, „Laughter“ is connected to the Devil because laughter will set you free. So - is Lucifer with his symbolic light on this card here coming to punish his captives, or is he the good guy that assists them to achieve freedom? It is your own choice. 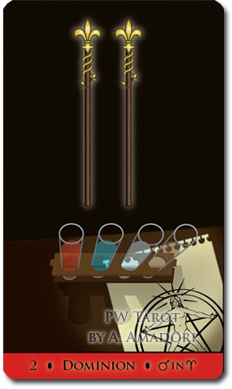 We see here four test tubes with different content. They represent the four elements and are placed on a table. In many spiritual rituals, an altar with the four elements placed on it is an inherent part. The elements are often represented by the same symbols the Minor Arcana works with: a wand for fire, a cup for water, a dagger for air and a pentacle for earth. The altar can be seen as the bearer of life. The elements are ruled by the mind, or by love, it depends on how you call it. If you do not put this fifth ingredient above the four elements to rule them, chaos and weakness will occur. It is the pentagram upside down, known as a symbol or darkness (please note that I am not condemning Satanists here, I am just talking about the symbol and its spiritual meaning). Life under this sign is difficult. You could then be ruled for example only by emotions, which can lead into deep trouble. Being ruled by desires brings forth only pain. Or if the strive for material gain dominates, it can make you neglect your emotional side which will lead to loneliness. The upright pentagram, as we see it here on the card, is a symbol for harmony, balance and dominion. You can be ruler of your life only if you put your mind above the elements. One of my favorite novels is Dostoyevsky’s „Crime and Punishment“. It made a real big impression on me. The main character, Rodja Raskolnikov, made a huge mistake by murdering a pawnbroker and then suffering from the most horrible psychological pains of regret and fear. The world in which Raskolnikov lives is shaped by poverty, hunger, desperation for money and the painful labyrinth of love that Dostoyevsky was a master in narrating. 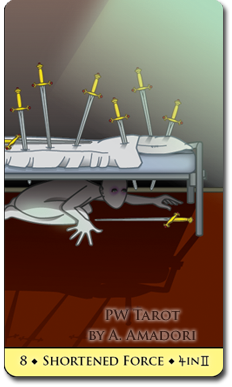 This world strongly reminded me of the complicated suit of swords, where almost every card represents difficult sides of character that we have to overcome or at least somehow deal with. 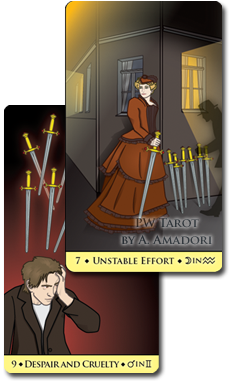 Raskolnikov served as the model for the character I show on the nine of swords. A photo of “Dom Raskolnikova” (Raskolnikov’s house) in Saint Petersburg served as blueprint for the background we see on the seven of swords. 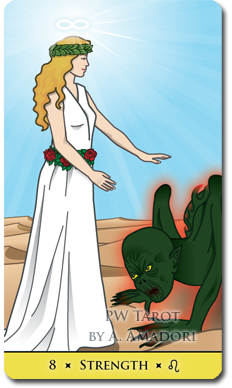 Only three cards in my deck show a scene that is inspired by a passage of the bible, and this is one of them. 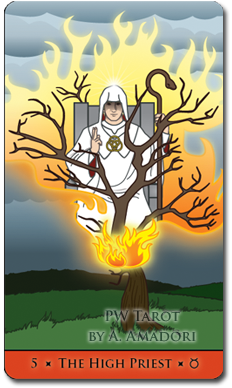 The High Priest is a very important card in the Major Arcana if you study the path of esoteric Tarot, where the cards are also used for meditation. But also if you use the cards for divination, the High Priest is connected to meditation. He represents the Inner Voice, which is sometimes called the Small Voice - because this voice is not the inner dialogue you hear all day long and during the first attempts of meditation. It comes from deeper within and is not as loud. A very famous episode on someone hearing a voice talking to him is descripted in the bible. It was Moses who was wandering as a shepherd through the country, when he saw a bush that was burning, but it did not char. When he came closer he heard the voice of God talking to him, and he covered his face because he was scared to look. When we meditate and search for that inner voice to guide us, we also have our eyes closed. We turn inwards and if we manage to find the voice of the High Priest we have the connection to a source more precious than any other. I like this card so much in a reading because it is truly a herald of good luck. All of the court cards appear friendly, but most of them, just as real persons, tend to become strong enemies when you oppose them. The Squire of Coins is the good-hearted nature that will not turn against you. 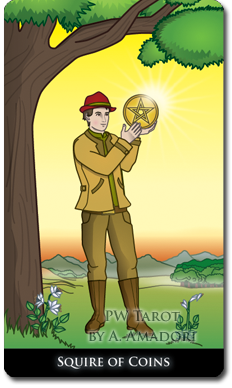 Messages delivered by this card are positive; projects that start under its influence are bound to be fruitful. Just like the few benevolent people in our lives, this card turns up much too seldom. The spring-like landscape in which he stands, and the gentle evening sky are a pleasant surrounding and represent the positive sides of the suit of coins: blooming nature, fertility, riches of all kinds. I think this is best way to look at the material energy in life. The famous motivational author, Louise Hay, has once stated that she made the experience that it is far more difficult, also in the sense of socially accepted, to talk about money than about sexuality. This does not really surprise me. No one ever talks about money or what he/she earns. Envy is strongly attached to the matter of money. I am always happy to see the Squire with his positive energy where we find no envy, fear or regret, just the natural joy of growth. In many books about Tarot, explanations about the High Priestess include the word „Secrets“. But when doing a reading, we are looking for answers, and not even more secrets, right? So, how to interpret this card? The woman on the picture certainly is not the most talkative. The calm sea and the moonlit night symbolize peace and quiet. The woman seems to be of withdrawn character, and yet she pours out the very essence of life for us. 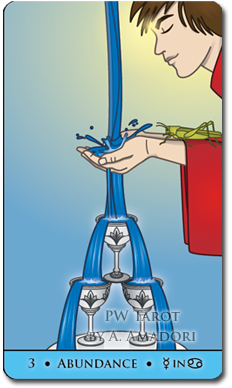 The water that flows off her bottomless pitcher and off her dress is the water of life, some alchemists among the Tarot experts call it the „Prima Materia“. It is the mental fabric out of which everything is made. You see that water on the cards following the High Priestess. It is the pond in the background of the Empress. It is also the water from which the woman on the Star emerges, and it finally finds its way to be the rainbow-crowned sea on „The World“. The High Priestess, often seen synonymous with mother Mary of the bible, is the starting point of life. For divination, the most important meanings of this card are: Feminine powers. A keen sense of knowing. New solutions. The “knowing” what the right thing to do is in some situations. Trusting the intuition. Reticence (not as virtue but as modus operandi in some situations). 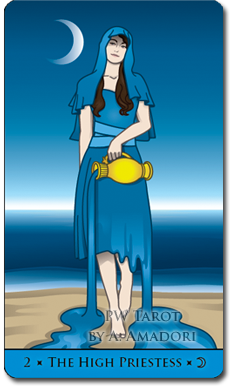 We have to keep in mind that this is the suit of cups which represents the more emotional sides of life. The happiness here is shown as a beautiful landscape, a summer house and a delicious dessert. It is the surrounding of someone financially well off, but at the moment we do not see money, cars or jewelry, but a comparatively small joy that brings big pleasure and peace. The astrological correlation, Jupiter in Pisces, also tells us this. Jupiter, the planet of expansion and large-handedness acting within the dreamy and emotional Pisces: this is not the success-striving moneymaker but the one who is a provider, benevolent and sometimes even too generous. This card is one of the few where the declaration on the card perfectly sums up its meaning. Rest from Strife. Physical or emotional strife, so it can mean a stay at home or hospital, or simply a lot of quiet time where it is possible to let our wounds heal or reflect on what caused them. A lot of sleep will be involved. On my card I show a person who looks asleep, but is having an out of body experience. The reports of out of body experiences vary a lot. They vary as much as people telling us their dreams at night. The astral world is limitless. I experimented a lot with astral projections, which is only possible through deep relaxation. The astral world I experienced was a quiet and somber place. It is a place of self-reflection but also of seductive depth where one can easily get lost. Some people say it is like being a ghost: you do not belong in the world where you appear, and you see mostly only what you want to see. Well, don‘t we all love the Fool!? His youth, his innocence and the total absence of worries. His ability to keep his focus on a higher goal, even if everybody calls him a fool for it. Surely he will fall down the cliff into a world that I drew here as barren mountains with the sunset in the background. But is that so bad? The Fool falls into our barren life to bring full bloom. Wherever he treads, flowers start to grow. When he leaves, he leaves you with life all around you. He is the first seed that brings forth a big harvest. His boyish smile parts the clouds. He juggles the phases of the moon because he is aware of the natural phases in life, but time has no meaning for him. 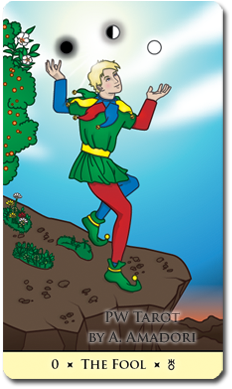 Whenever you feel trapped or don‘t know how to begin (a project, a journey or simply just the day in the morning), the fool is an uplifting image to look at. One of the favorite card of many readers, but it is a difficult one to understand and even more difficult to actually implement. Theoretical understanding is one thing, but we want to bring the messages of our readings into our lives, too. Strength means that our maiden here has the beast under control. She tamed it not by force, because force would be useless against a creature a hundred times stronger than her. It might even mean her own death. Playing with demons or thinking you can overpower them by force is an illusion. Have you ever been angry? Really angry (or jealous), so that your hands trembled, like under electricity and you were about to lose your head? How hard was it to get yourself under control? You barely managed? You see how hard it is to control a negative emotion, so how can people think they alone are strong enough to control a demon? Here, calmness and patience play a key role. Being hot-tempered does not necessarily have to end up in explosions wherever you show up. In fact, it can be a blessing. Strength means here to channel inner power so it comes out as something useful and uplifting, and not destructive.